The December 2017 issue of Classic & Sports Car magazine. 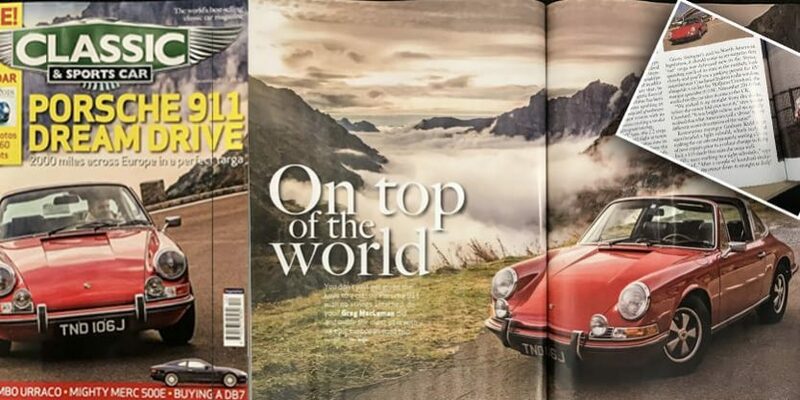 The front cover star and subject of a ten page spread, is the stunning 1971 911 Targa we had here some months back. We collected the car straight from the docks after it had been shipped to the UK by its new owner from the US. Restoration man Graham carried out some light and mainly cosmetic work including a colour change from the original yellow to ruby red. On its completion, it was collected and driven straight to Italy without issue. The magazine feature tells the story of journalist Greg MacLeman’s trip back from Italy in the car, through Switzerland and France, to the docks at Calais ready for its return to UK shores. 1,800 miles in 3 days, not bad for a 45 year old! Coupled with some stunning locations and fabulous photography by Tony Baker, the article is a great read and gives a good insight into driving a classic car on this kind of adventure.